Diamond ring with a central pear cut emerald that is the protagonist of this set. 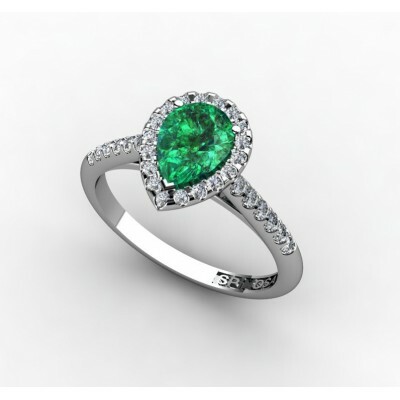 The emerald is rounded by smaller diamonds that make this ring very sweet and elegant. 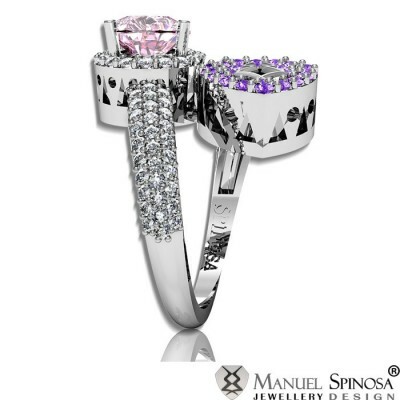 This ring is perfect to be a very special present in a very special moment. -Diamonds: 18x1.4mm and 22x 1.1mm. Total 0.28cts. 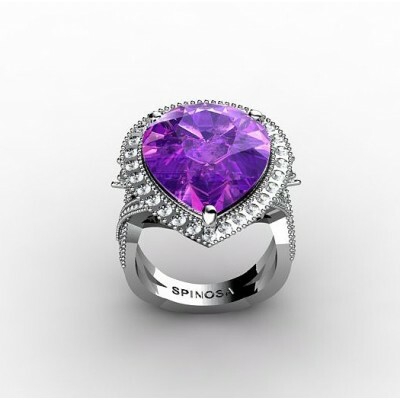 Exclusive Designer Ring made with 11.18gr of 18k White Gold and Beautiful Pear Cut Amethyst of 11x7mm and 22 Amethysts of 1.5mm. 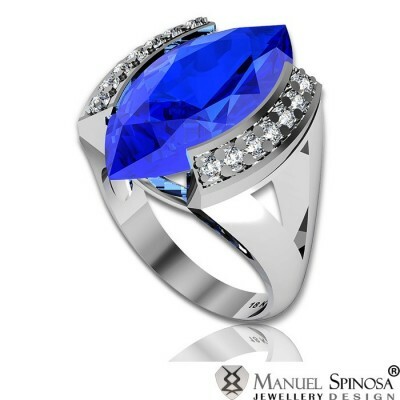 The ring is decorated with 82 Brilliantes with a total weight of 699ct-HVS1. 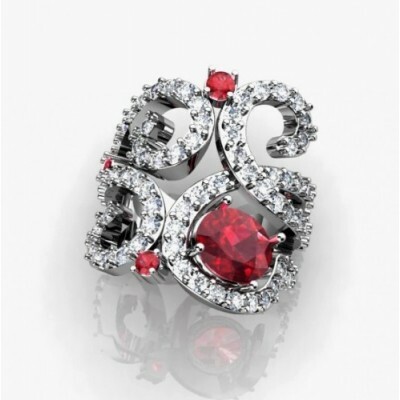 Stylish gemstone ring with a wide design and a glamorous ruby in the center. The ruby has an oval shape, measuring 9x7mm. It also has a curved shape where you can see 75 brilliants in 2mm size and with a total quality of 2.60ct H-VS. Furthermore, there are three round rubies, measuring 2.5 mm and 3 mm. 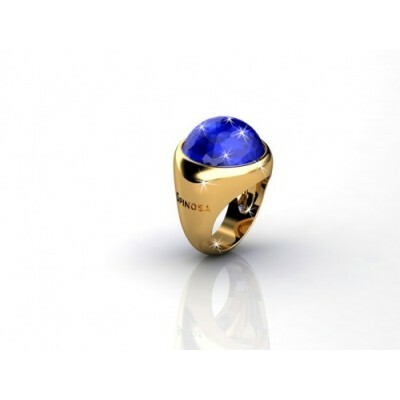 Splendid 18k gold ring with a beautiful big central gemstone of your choice. Stand out and be unique among the others. This quartz-graffiti ring is made of 18K white gold. 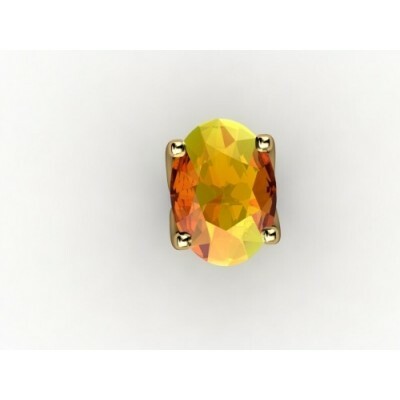 Its central gem has a size of 13X18mm and it is surrounded by diamonds of 1.5mm in size. On the sides, it has 8 brilliants of 2.25mm with a total quality of 0.93ct H-VS. Perfect for the modern man and woman, this classic 18k gold ring with intricate patterned ring design and a central yellow topaz exudes a chic and elegant feel to make it one of the best sellers in contemporary jewelry fashion accessory. This unique ring is inspired by a snake in its shape. 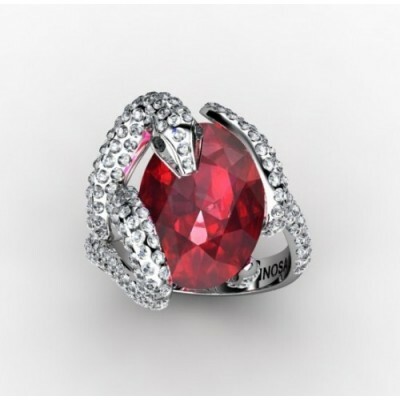 It is made of 18K white gold with a central ruby in oval shape, measuring 11x16mm. 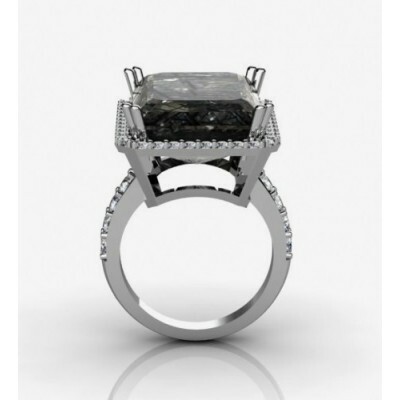 It is surrounded by diamonds with a total of 2.33ct quality H-VS. It symbolizes prosperity and fortune. Beautiful and truly exquisite marquise cut blue topaz ring made with 12.18gr of white gold and 14 brilliants of 1.5mm with a total of 0.21ct-H-VS1. Trying to attract fortune? 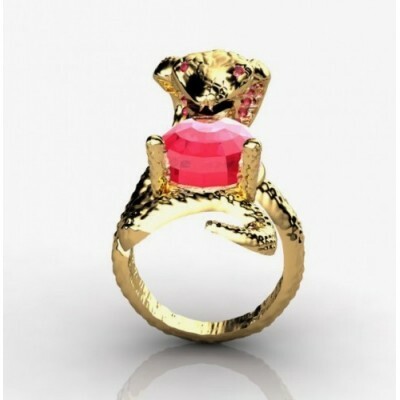 If yes, then you may have this snake ring that is made of 18K gold. It has a beautiful central red ruby, measuring 8X10mm. On its head, there are 12 rubies, measuring 1.2 mm and there are 2 rubies in the eyes. Feel beautiful with this cocktail ring that is made of 18K white gold with a central Amethyst, measuring 20mm. It is surrounded by brilliants, measuring 1.75mm . The sides of the ring form a "X" that is covered with brilliants. 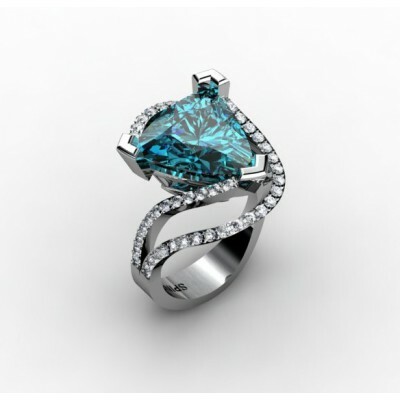 Add this 18K white gold ring with central topaz in triangular shape to your wish list! 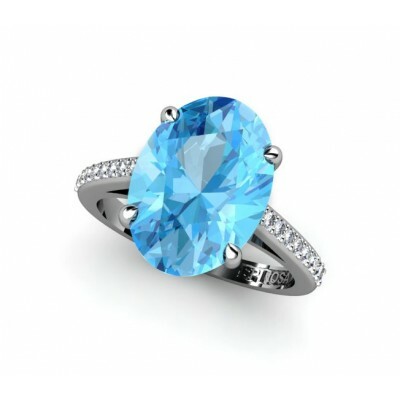 The topaz measures 14mm and it is surrounded by diamonds which have a total quality of 0.73CT.